Do You Crave Sugar or Struggle with Fatigue? The hidden epidemic that can trigger weight gain, increase anxiety, destroy digestion and fuel sugar cravings. Are Parasites Your Missing Diagnosis? This is an Intestinal Parasite. Could unsuspected parasites be holding your health hostage? Most people still dismiss parasites as a third-world concern. 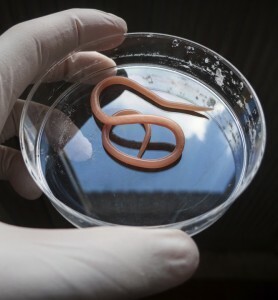 But, a study in The American Journal of Tropical Medicine and Hygiene found that 32% of a nationally representative sample of 2,896 people tested positive for parasitic infections, and at least 48 states have fought measurable outbreaks. It’s time that this epidemic finally be brought into focus. Increased international travel, improperly washed fruits and vegetables, undercooked/raw or microwaved fish, meat and poultry, polluted soil and water and inadequate hygiene (particularly in daycare and senior centers) all contribute to the spread of parasites. Parasites are responsible for an enormous panorama of human health problems. Within our bodies, these critters consume our food and nutrients, producing toxic wastes, and eventually even destroying our tissues and cells. As the most immunosuppressive agent in the human body, parasites produce indole catabolites that our eliminating organs like the kidneys and liver have to work overtime to excrete. In addition, our immune system goes on overdrive, emitting substances called cytokines that trigger a variety of immune responses. These high levels of cytokines have been linked to increased incidences like violent suicide attempts as well as depression. Cytokines can pass through the blood-brain barrier and negatively impact neurotransmitters such as dopamine and serotonin in the brain. Sugar cravings – A diet high in simple carbs like sugar, white flour, and milk can fuel your uninvited guests, even so-called “natural” sweets—honey, rice syrup, fruit juice sweeteners—provide instant nourishment for your internal hitchhikers. Simple carbohydrate foods require more time to pass through the alimentary system. A sluggish transit time allows more food to decay and putrefy, thus producing stagnation in the colon and an inviting environment for toxic buildup. Anxiety – Toxoplasmosis infection has been dramatically and significantly linked to General Anxiety Disorder (GAD), for example. Secondary dairy and gluten intolerance – Many parasites, like roundworm and Giardia, can trigger secondary lactose and casein intolerance, so avoiding milk and cheese is a must. Because of the damaged intestinal villi, Giardia can also precipitate a type of gluten intolerance. With any protozoan infection that can damage the intestinal villi, it is always a good idea to reduce the intake of grains. Food and environmental allergies – Parasites irritate and sometimes perforate the intestinal lining, increasing bowel permeability to large undigested molecules and activating the body’s immune response, causing allergic reactions. Anemia – If enough parasites are present, you can lose enough blood to cause iron deficiency or anemia. Constipation – Some worms, because of their shape and size, can block the bile duct and intestinal tract, making elimination difficult and infrequent. Gas and bloating – Some parasites live in the upper small intestine, making persistent abdominal distention a frequent sign of uninvited guests. Irritable bowel syndrome – Parasites can inflame the intestinal cell wall, leading to various GI symptoms and malabsorption of vital nutrients. Joint and muscle aches/pains – Some parasites can migrate and encyst in joint fluids and muscles, leading to chronic inflammation. Skin conditions – Parasites can cause allergic skin reactions: eczema, hives, rashes, sores. If a few of the warning signs sound familiar, it may be time for a parasite cleanse! Here are a few things you can do, it will require discipline and patience or you can drink this tea that has been proven to work, it’s guaranteed. Click here to watch this quick video on the benefits of this tea, it does MORE that just kill parasites! I’m writing this blog because I want to show you that I am not just here to sell you a tea, I am here to educate you. Who wants to sit around and wait to do all these things listed below to kill the parasites? NOT ME! Feel free to use this information but if it were me, I’d just drink the tea. Up your digestive enzymes, probiotics and HCl. All three are critical to the process of parasite elimination. You want your stomach and your gut to be acidic in order to provide an inhospitable environment for the critters to take route. Limit raw of all kinds, especially if you eat out. Eat plenty of properly cooked proteins like wild-caught fish, organic meat, free range chicken and pastured eggs. Protein provides the amino acids necessary to strengthen tissues and enhance immunity. Gently increase fiber intake. Soluble and insoluble fiber have amazing detoxification and sweeping effects on both large and small invaders. Get the sugar out. The worst offenders are those liquid sugar calories from soda and fruit juice. Eliminate cold drinks. These act as a shock to the body and cause the intestinal tract to contract and hold on to waste materials, exactly what you don’t want during this detox period. Avoid most dairy and gluten-based products. The exception to this dairy ban would be plain organic yogurt and kefir. Up the beta-carotene. Based upon clinical studies it appears that of all the vitamins and minerals, vitamin A best increases resistance to tissue penetration by parasitic larvae. Foods rich in pre-vitamin A or beta-carotene (think brightly colored orange and green veggies) should be added liberally to the diet. Note that a serving of organic wheat grass juice powder or capsules is a convenient way to obtain beta carotene as well as the nutritional value of three pounds of organic green veggies. Think zinc. Along with vitamin A-rich foods, please increase your zinc. Vitamin A and zinc are by far the two most important nutrients to add to your diet for parasite-proofing. Zinc can be found in beef, turkey, lamp, eggs, and pumpkin seeds. Use onions, garlic, cloves, and fennel in cooking and nibble on pumpkin seeds as a snack. These are all well-respected and time-honored parasite controllers. Try colonic cleansing. Home enemas and colonic irrigation can play an important role in cleansing the colon of parasites. Garlic enemas, for example, are especially helpful in eliminating pinworms. Take a tablespoon of fish or flax oil. Fish and flaxseed oils are especially helpful with parasites because their fatty acids are absorbed so readily in the structure of the body’s cellular membranes thus providing protection down to the cellular level against hidden invaders. The oils also lubricate the gastrointestinal tract and serve as a carrier for fat-soluble vitamin A, creating an environment uninviting for waste, toxins, and microorganism buildup. Sip therapeutic teas. Drink one to two cups of mugwort tea every day. Mugwort hardly sounds like a formidable herb, but the tea made from it has been used for generations to kill intestinal parasites. Try some antiparasitic supplements. For the microscopic parasites try an herbal formula consisting of cranberry concentrate, grapefruit seed extract, Artemisia annua, pomegranate, peppermint, slippery elm and bromelain. Cranberry is especially important because its organic acids kill parasites by breaking down their protein structure and stimulate the release of parasitic waste. For the larger worms and flukes, try an herbal tincture containing black walnut, wormwood, centaury, male fern, orange peel, cloves and butternut. Centaury is an herb revered by Native Americans for its ability to relax the parasites triggering release of their hooks and suckers from the intestinal tract which is especially effective the newly uncovered human rope worm. Amin, Omar M. “Seasonal Prevalence of Intestinal Parasites in the United States During 2000.” American Journal of Tropical Medicine and Hygiene 66.6 (2002): 799-803. Web. Gittleman, Ann Louise. Guess What Came to Dinner? : Parasites and Your Health. New York: Avery, 2001. Print. Gittleman, Ann Louise. The Gut Flush Plan: The Breakthrough Cleansing Program: Flushes Fattening Toxins, Boosts Your Metabolism, Fortifies Your Health. New York: Avery, 2009. Print. Wilcox, Christie. “Toxoplasma’s Dark Side: The Link Between Parasite and Suicide.” Scientific American. N.p., 4 July 2012. Categories: Uncategorized | Tags: anxiety, chronic diseases, depression, detox, detox tea, detoxification, digestion, fatigue, parasites, worms | Permalink. Kathyryn you’re not by yourself I am a all around health nut trying not to even taste dealth or sickness or disease. I want longevity life. So it’s good information you are posting for people who want to treasure their health and get started with it. Keep up the good health. I’m trying to talk to different ones personally and give semi nutritional meetings and siminars. Keep up the good work sister. Thanks Gloria. I’m glad you are enjoying the information.